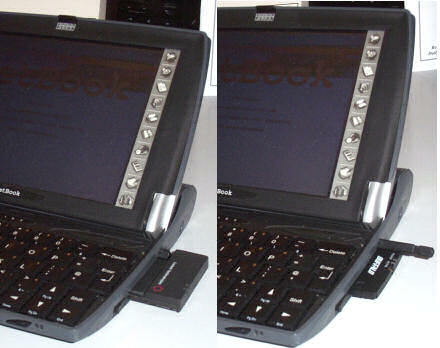 Spot the difference: The difference between the Lucent Orinoco WiFi card and the Buffalo AirStation cards in a Psion 7Book. This evening I installed a new (to me) WiFi card in my Psion 7Book. Out went the Lucent Orinoco Gold (above left); in went the Buffalo AirStation WLI-PCM-L11GP (above right). The main difference, as you can see from the photographs above, is that the Buffalo is much shorter, and doesn’t block the stylus port. 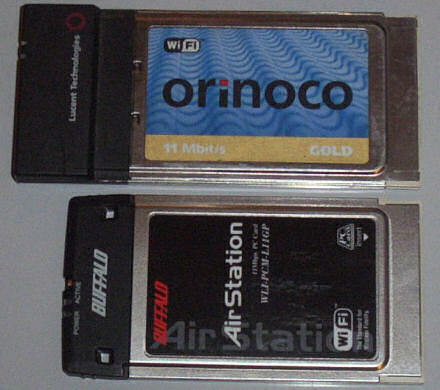 The much longer, and bulkier Lucent Orinoco Gold WiFi card sitting beside the slimmer Buffalo AirStation WLI-PCM-L11GP. In order to get the Buffalo card to work — having been using the Lucent Orinoco for months — I had to perform a full hard-reset (which involves removing the batteries and waiting a minute) and reboot the 7Book from scratch with a Compact Flash card containing the latest EPOC R5 operating system (NetBook OS v.1.05 (450) R158). Both cards use the same chipset, which I think is why I had trouble trying to install the Buffalo. I got some advice on the PDA Streets Psion Place forum to perform a full hard reset and it worked! Getting your hands on these WiFi cards these days can be a struggle. I managed to get both of mine on eBay UK for around £30 – 40 each. But it took some looking, and waiting. It involves editing the Opera.ini file adding the line Warn Insecure Form=0 beneath the [USER PREFS] section. And it works! So there you have it. One of these days I’ll get up to speed and add all this to my main Psion website; in the meantime it’s here for reference. I now just have to reinstall the rest of my favourite applications on the 7Book. The joys of hard resets! Beware: there’s a switch on some laptops that disactivates the WiFi card. It can take some effort to discover it, however! Last night while I was round at my parents-in-law I said that I’d help my father-in-law set up his new Toshiba Satellite M70 laptop. I’d already been around a few weeks before and set up their BT broadband. “Is it connected to the broadband?” I asked. They did, and I duely entered them. I then entered them again, this time spelling “duly” correctly. Would it? No! In fact, it didn’t work for the next thirty to forty minutes. I tried everything that I could think of. 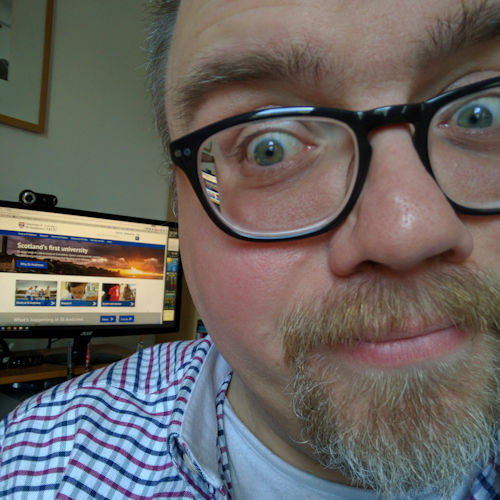 I even installed the excellent NetStumbler to see if it could sniff out any local networks to determine whether it was just theirs that I couldn’t see. 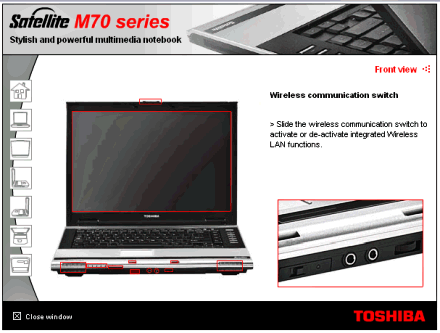 Turns out that these fancy new Toshiba laptops have a physical switch at the front of the case to physically switch on or off the WiFi card. It’s for use in hospitals and onboard aircraft. When I flicked the switch then it connected! I think there’s a lesson there for us all.